← Life is a short warm moment and death is a long cold rest. 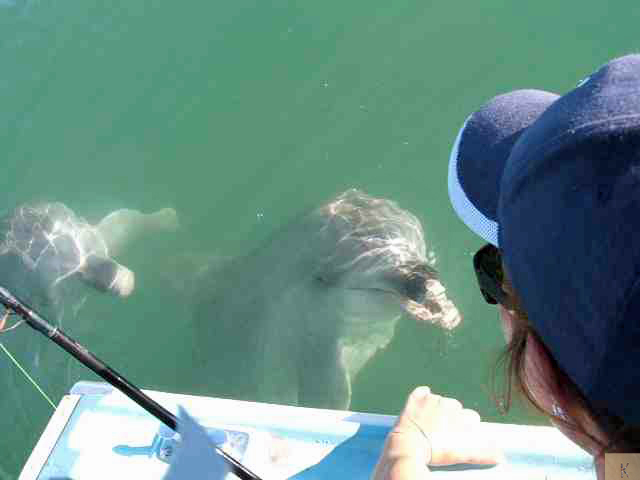 Fishing on Moreton Bay in Queensland, Australia a few years ago, I had to pull in my line when a pod of curious dolphins came to say hello. I was amazed at how friendly they were considering they had a couple of very small babies with them. I was so tempted to jump into the water with them. Instead, I leant over the side of the boat and had a chinwag. I think this pod is the one that visits Tangalooma and is comfortable with human contact and associates us with food. I gave them my fish. I wasn’t doing well anyway and only caught enough fish to make cleaning them a pain and I had way more enjoyment feeding the dolphins. I love fishing but get a bit “girly” killing my catch. Gutting and cleaning them doesn’t bother me. I don’t like using live bait. I get all sorry for the poor bait thing when sticking a hook in it alive. This entry was posted in Australia, Photography and tagged Australia, Dolphin, Fishing, Moreton Bay, Moreton Bay Marine Park, Queensland, Tangalooma. Bookmark the permalink. Oh for sure Pauline. How could I refuse handing over my fish?